The gene explorer (GeneX), from the biology department at UMB, simulates the transcription, splicing, processing, and translation of a small hypothetical eukaryotic gene. GeneX allows learners to make specific mutations in a gene sequence, and it then calculates and displays the effects of the mutations on the mRNA and protein. Finds the promoter and terminator. Reads the DNA sequence to produce the pre-mRNA. Splices and tails the mRNA. For more information about the gene explorer, see The Gene Explorer. width and height specify the dimensions of the application, in pixels. genex_dna_sequence is the default DNA sequence that appears when the problem opens. 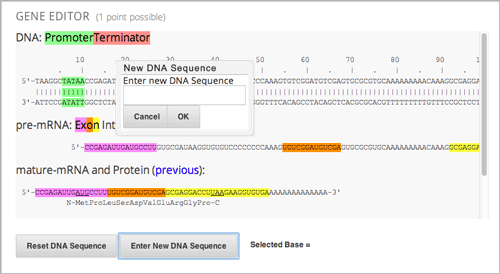 dna_sequence contains the application’s state and the learner’s answer. This value must be the same as genex_dna_sequence. genex_problem_number specifies the number of the problem. This number is based on the five gene editor problems in the MITx 7.00x course–for example, if you want this problem to look like the second gene editor problem in the 7.00x course, you would set the genex_problem_number value to 2. The number must be 1, 2, 3, 4, or 5.